Broome Community College is a two-year college located in Broome County, New York. 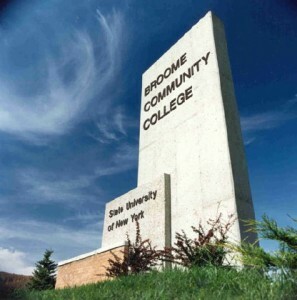 Broome Community College was founded in 1946 and has since gone through several name changes, finding its current name in 1971 as Broome Community College. The college had enrollment in 2010 of over 6,000 students, and has alumni of over 41,000. SUNY Broome Community College has become one of New York’s most comprehensive community colleges. The school offers students wide selection of degree option in many different fields including: Health Sciences, Technology, Engineering, Liberal Arts, Math and Business. Broome Community College offers students a wide variety of classes. It is a highly popular choice for students pursuing their two year degree or those that plan on transferring to a four year school. Binghamton University is a popular choice for students to transfer to after their first two years. The school’s faculty is diverse and hands-on. Many members of the faculty are very accomplished in their field of study allowing them to provide the students with diverse educational opportunities, including internships and unique field trips. The school does its best to provide flexible courses online that allow the student to get an education while being employed during the day or living at a distance from the school. Tuition is set for the 2012-2013 year for students carrying more than 12 credits (full-time students) at $1,910.00 per semester with a residency certificate and at $3,820.00 for students without a residency certificate. For out of state residents tuition is set at $3,820.00 per semester. It is important to note that there is financial aid available for students who qualify and tuition costs are subject to change. Broome Community College educates students there sole campus in Binghamton. The school is located in the historic Susquehanna Valley. Some students can be taught in Waverly and Owego at the smaller satellite campuses. The campus has 15 buildings. The College features recently upgraded athletic complexes including soccer and baseball fields. Students interested in drama can flourish at the campus performances of plays and other theatrical work at The Little Theater. Broome Community College encourages students to get involved in as many clubs and organizations as they feel comfortable with. This will allow students to have a full and rich college experience while honing their craft. The student body at the school is very culturally diverse, with students coming from over 41 different countries. There are many different extra-curricular activities for students to participate from including, but certainly not limited to, gardening, dance, religion, and the computer club. There are also many on campus jobs that students can work at allowing them flexibility to manage their courses, social life and more. Many students have come through their program at Broome Community College and credit it with their successes in life. Broome Community College gives many students the educational backdrop necessary to further pursue their studies and develop their careers. The coach of athletics at Broome Community College holds the record for victories by a college coach, who currently standing at 879 wins.